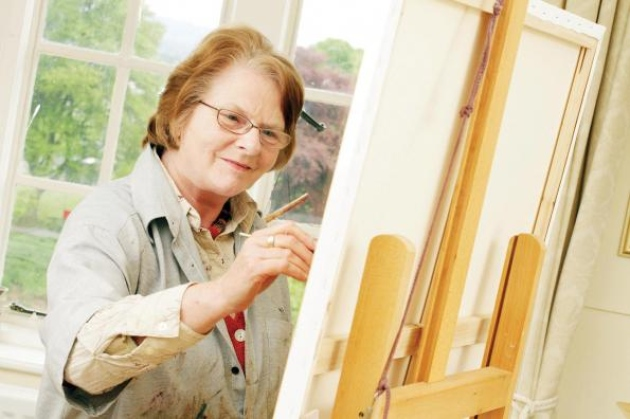 Portrait painting – I work mostly in oils, but also watercolour and pastel. Below is an extract from Iris Murdoch’s ‘The Sandcastle’, the story of a young portrait painter, Rain Carter, who is painting Mr Demoyte, the school’s former headmaster. It’s a novel which I read many years ago, but this extract has continued to influence how I look at the sitter, and which inspires my search for character and ‘soul’ – the sitter is thinking, even in repose. Recent commissions include: Dom Paul Stonham, Abbot of Belmont; Dean Michael Tavinor and the Rt Rev Anthony Priddis, both of Hereford; 3 portraits of Pro-Vice Chancellors for Worcester University; Elizabeth Hunter, High Sheriff of Hereford and Worcester; Claudia Bobadilla, Vice President of the University of Development, Chile, and wife of the Chilean Ambassador to the Court of St James. All these are oil on canvas. Elisabeth Cross at 100 years old.